Today, in an era when for-profit senior care chains dominate the market, Homeland—a Harrisburg-based 501(c)3 non-profit organization—remains steadfast with a keen focus on our local communities while delivering more personal, benevolent and compassionate care throughout the region. Our proud tradition of exceptional medical care began 150 years ago, when Homeland Center (our “bricks and mortar” facility) opened its doors. Today, Homeland Center is a personal care home and skilled nursing center which provides a wide variety of services to the aging population of the greater Harrisburg area. Homeland Hospice the first Homeland at Home community outreach program, was founded almost a decade ago. 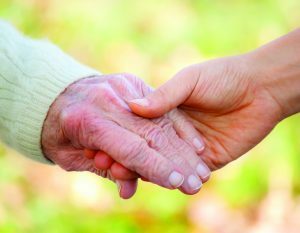 Hospice specialists provide pain relief, comfort and peace to patients in end-of-life situations, along with compassionate support to families and loved ones. More recently, two additional outreach programs have been introduced. Homeland HomeCare is delivered by our team of certified nursing assistants (personal care aides) who help seniors with companionship, hygiene, meals, transportation and more. Physician-ordered Homeland HomeHealth medical treatment helps patients heal and recover in the comfort and convenience of their own homes after illness or injury. Our focus promotes healing, recovery and quality of life. A Homeland outreach specialist stands ready to discuss your specific needs…just contact us to arrange a personalized appointment.